This image shows several parallel segments of the Cerberus Fossae. This is a system of fissures formed by extension and stretching of the near-surface of Mars. It is associated with some of the most recent large-scale events on the planet. 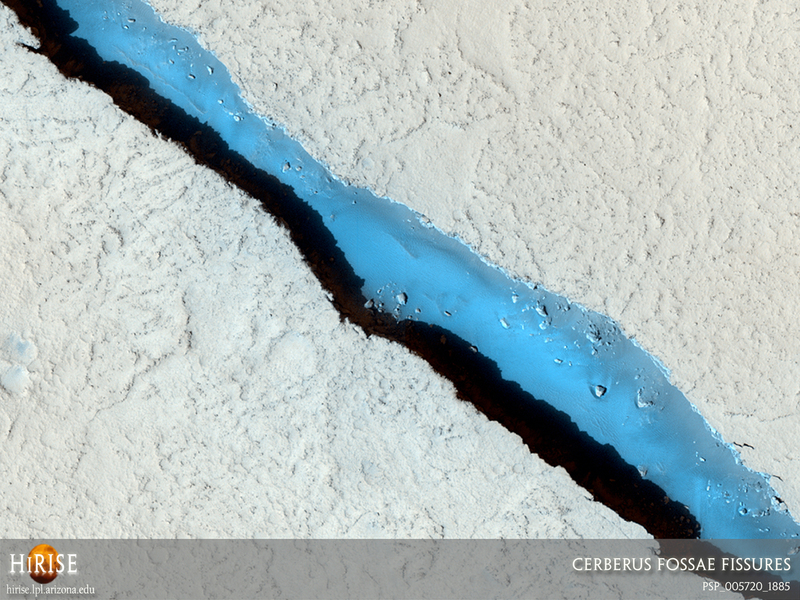 The Athabasca Valles channel system has its source at one segment of the Cerberus Fossae. This channel was most likely carved by a massive flood of water, perhaps released by the same tectonic processes which formed the fossae. Cerberus Fossae then extruded a large lava flow that draped Athabasca Valles. HiRISE images were recently used to describe details of this history in a paper published in the journal Science (Jaeger et al., Science, volume 317).